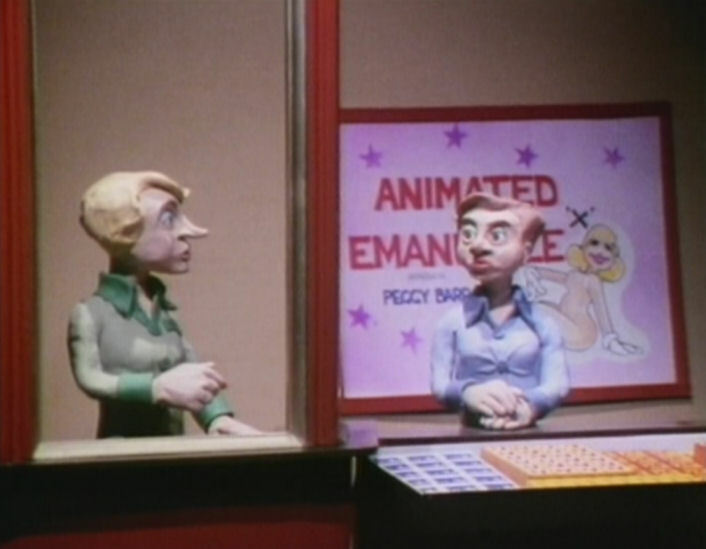 ‘Making ‘Em Move’ is a surprisingly original cartoon, being about animation itself. It’s astonishing that this early cartoon about its own industry comes from the Van Beuren studio, the least developed American animation studio in business those days. The film is a strange mix of accuracy and nonsense. We watch a fat lady visiting an animated cartoon studio, where several animals are animating ridiculously fast and as if in an assembly line. Among the less accurate scenes are an animator animating a dancing cat who’s dancing right in front of him, and a humanized camera filming the flip-books animators are running in front of it. Meanwhile a jazz band is playing, whose sound is recorded directly on film. In the second half of the film we watch a public cartoon screening: “Fable Animals present Little Nell’, a crude animation of a classic melodrama with stick figures, predating Tex Avery’s similar ‘Porky’s Preview’ by eleven years(!). ‘Making ’em Move’ is a remarkable cartoon, being about the cartoon industry itself, which remained a rare feat. Unfortunately, the film is neither very educational nor funny. It’s in fact rather directionless, making it to fall short as a classic. Walt Disney himself hosts a Disneyland television episode on the history of animation, from the humble attempts to capture movement in drawing in the caves of Lascaux to his own masterpiece ‘Fantasia’ (1940). 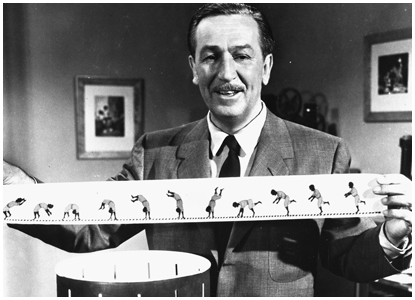 Disney demonstrates some early devices of animation like the thaumatrope, the phenakistoscope, the zoetrope and the praxinoscope, showing that animation in fact predates cinema. One of the highlights of the program is the complete showing of one of Charles-Émile Reynaud’s animated “films” for his own praxinoscope device. The other one is the reenactment of Winsor McCay’s vaudeville show with Gertie the Dinosaur (1914). This part alone makes the episode worthwhile watching, as McCay’s classic work becomes even stronger in its vaudeville context. 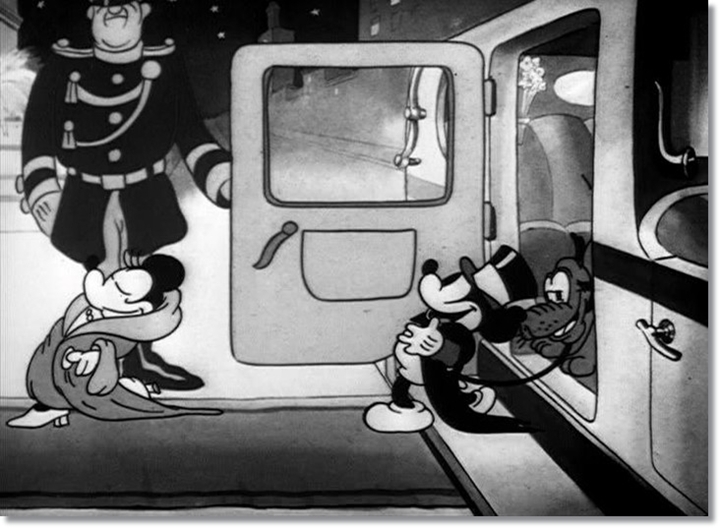 More animation from other early studios is shown, like Bray’s Colonel Heeza Liar, Raoul Barré’s Silas Bumpkin, Earl Hurd’s Bobby Bumps and Pat Sullivan’s Felix the Cat. 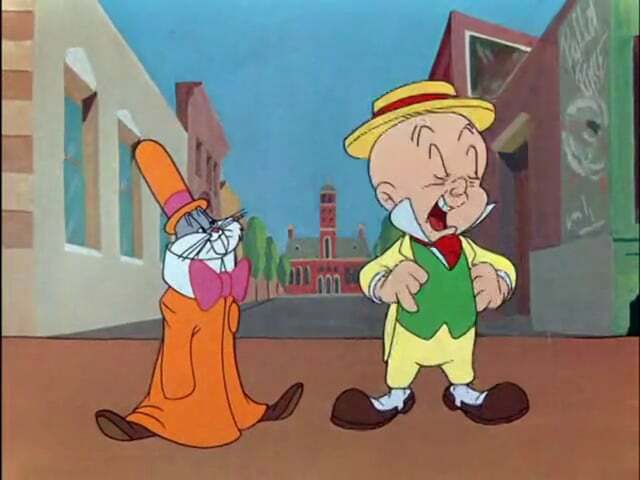 Disney also plays tribute to his old rival, Max Fleischer, by showing a Koko the Clown cartoon, accompanied by organ playing by his own cartoon composer, Oliver Wallace. The show ends with one of Walt Disney’s major achievements, the Nutcracker Suite from’Fantasia'(1940), which, unfortunately, is shown in black and white. 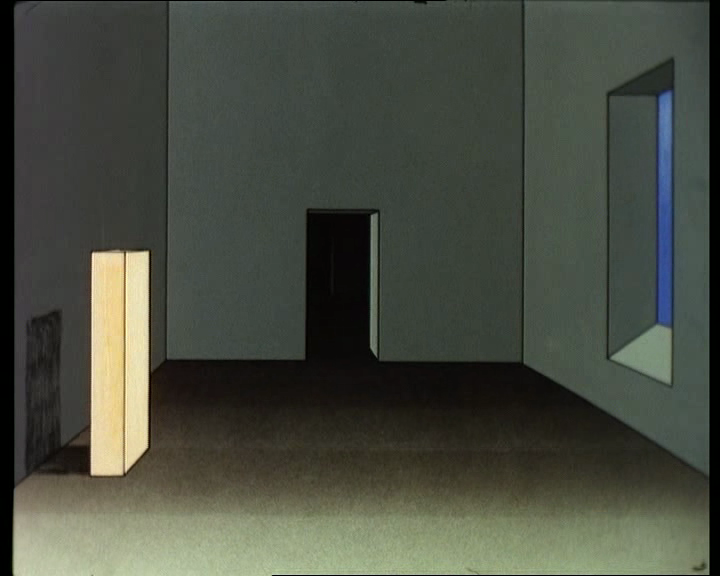 ‘Le ravissement de Frank N. Stein’ starts with very abstract images, which resolve into Frankenstein’s laboratory as depicted in the film from 1931. This film, which is set to very nervous electronic music, is a very impressive study of perspective: we really feel we are walking. The film has a repetitive and dreamlike quality, which is enhanced by its surreal settings, reminiscent of paintings by Giorgio de Chirico. ‘The Cameraman’s Revenge’ is one of the earliest animation films ever made, and a very early masterpiece (it predates ‘Gertie the Dinosaur‘ by two years). Surprisingly, it’s a film about adultery involving insects. The plot of this stop motion film is as follows: Mr. Beetle commits adultery with a dragonfly, who is a dancer at a nightclub. Unbeknownst to him his secret behavior is filmed by a rival grasshopper who happens to be a cameraman. Meanwhile, Mrs. Beetle also commits adultery, with a beetle who is also a painter. But they’re discovered by Mr. Beetle on his arrival home. Mr. Beetle chases the painter out of his house. Nevertheless he forgives his wife and takes her to the cinema. However, the film that is shown reveals his infidelity, which creates a riot and the married couple ends in jail for destroying the movie box. ‘The Cameraman’s Revenge’ is an extraordinary film, and without doubt one of the first masterpieces of animation. Unlike Émile Cohl’s stop motion, Starewicz’s animation is stunning and very convincing. The insects are very lifelike, and move surprisingly realistically. The insects’ gestures are subtle, clearly evoking their emotions. For example, there’s a beautiful and very lifelike little scene of a beetle servant lighting the fireplace, animated without any hint of overacting. On the other hand, Mr. Beetle clearly is a brute, but we can also watch him in a seductive mood. Throughout, Starewicz’s storytelling is economical and mature. The film’s subject is highly original for an animation film, even today. It’s almost unbelievable that such a modern film was made in Czarist Russia. 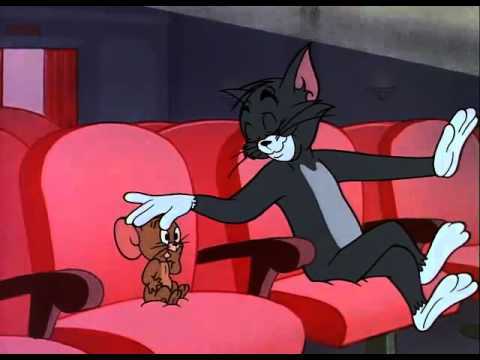 In ‘Matinee Mouse’ Tom and Jerry make peace and go watch their own cartoons together in a cinema. Of course, the truce doesn’t last long. ‘Matinee Mouse’ is a compilation cartoon, and a very cheap and terrible one, too. It uses footage of the classic Hanna/Barbera entries, but these are set to new sound effects and new music by Don Elliott. The gruesome result is easily one of the worst Tom and Jerry cartoons ever. 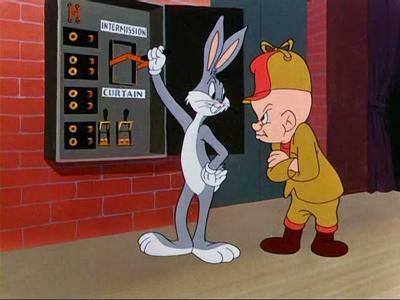 Its director, Tom Ray (1919-2010), directed only one other Tom & Jerry cartoon, ‘Shutter Bugged Cat‘ (1967). That one is also a compilation cartoon, and arguably just as terrible. ‘She Was an Acrobat’s Daughter’ is a cartoon about an evening at the cinema. It makes very clear that in the 1930s the experience of going to the movies was way more elaborate than nowadays: we watch newsreels, the audience singing to the title song and a feature, ‘The Petrified Florist’, a satire of the Warner Brothers film ‘The Petrified Forest’ (1936), with caricatures of its stars Leslie Howard and Bette Davis. 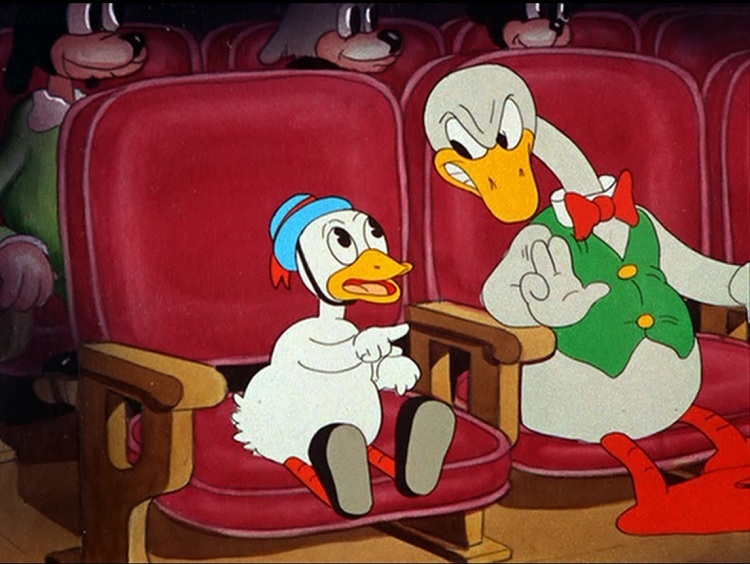 During the cartoon we’re confronted with several movie theater annoyances, like people changing seats, people passing by in the middle of a film, popcorn sellers and bad front row seats. In this cartoon, Friz Freleng really caught up with the new spirit at Warner Brothers induced by the coming of Tex Avery and Frank Tashlin in 1936. Gone is any resemblance to cuteness or children stars. Instead, there is an annoying duckling asking questions in an irritable voice, and causing havoc in the cinema. There’s no story, just gags, and the film ends rather unexpectedly. But the whole film is a sheer delight, aimed at laughs, and succeeding in it, too. Also featured is an early caricature of Adolf Hitler.